Objectives: To study the direct immunofluorescence (DIF) in cicatricial alopecia (CA) patients. Materials and Methods: Approximately, 155 skin biopsies from CA patients examined over 7 years (2009–2015). Special stains and Hematoxylin and Eosin were performed, and final histopathological diagnosis was made. DIF (against anti-IgG, IgM, C3, IgA, and fibrinogen) on all these cases and patterns were noted. The descriptive statistics were applied along with ANOVA test. Results: Approximately, 155 patients with Male: Female = 1.24:1, age 7–65 years. In total, 57 cases were of Lichen planopilaris (LPP; 36.7%), 22 Lichen planus (LP; 14.2%), 22 Psuedopalade of Brocq (PPB; 14.2%),16 discoid lupus erythematosus (DLE; 10.3%), 8 end-stage scarring alopecia (ESSA; 5.2%), 2 cases each of Fungal folliculitis (FF), and Folliculitis decalvans (FD; 1.3% each), and in 26 cases, no specific diagnosis could be reached were collectively kept in the category of non-specific findings (NSP; 16.7%). On DIF: LPP positive for IgG = 4 cases (7%), IgM = 26 (45%), IgA = 11 (19.3%), C3 = 16 (28.1%), and fibrinogen = 11 (19.3%). LP positive for IgG = 2 (9%), IgM = 18 (81%), IgA = 2 (9.1%), C3 = 10 (45%), and fibrinogen = 1 (4.5%). DLE positive for IgG = 6 (37%), IgM = 8 (50%), IgA = 1 (6.3%), C3 = 9 (56%), and fibrinogen = 1 (4.5%). Limitations: Because this was a retrospective study, clinical follow-up and treatment history of the patient could not be retrieved. Conclusions: IgG positivity helps significantly in differentiating LPP from DLE (P 0.004) and NSP from DLE (P 0.005). IgM positivity helps significantly in differentiating LPP from LP (P 0.04), LP from PPB (P 0.00) and NSP (P 0.00). C3 positivity helps significantly in differentiating PPB from DLE (P 0.02). Cicatricial alopecia (CA) results in hair destructionearlyin the course of the disease. For both clinician and pathologist, the forms of primary scarring alopecia (PCA) are problematic in terms of classification and diagnosis. It has been suggested that both histopathological examination and immunofluorescence studies are necessary for accurate diagnosis. PCAs are divided into subgroups depending upon the predominant inflammatory infiltrates, that is, lymphocytic and neutrophilic. Discoid lupus erythematosus (DLE), Lichen planus (LP), Lichen planopilaris (LPP), and Pseudopelade of Brocq (PPB) are categorized under “lymphocytic” PCA. The neutrophilic PCA group comprises Folliculitis decalvans (FD) and fungal folliculitis (FF) of scalp. There is paucity of studies from Indian subcontinent on direct immunofluorescence (DIF) patterns in different categories of CA. Our objective was to study the DIF pattern and their correlation with histological findings in CA. This was a retrospective study wherein histopathology material of the patients who underwent scalp biopsy for CA at our institution was retrieved. A total of 155 CA patients over 7 years (2009–2015) were included in this study. Because this study was retrospective, consent or ethical waiver from the institutional ethical committee was not needed. The blocks were retrieved and resectioned, stained, and studied again. Hematoxylin and Eosin (HE) and special stains [Verhoeff-Van Gieson stain for elastic fibers, Masson's Trichrome stain for collagen fibers, Periodic acid-Schiff's reagent (PAS), and Alcian blue] were performed wherever necessary, and final histopathological diagnosis was made. Tissue was cut at 5 mm, and standard DIF procedures were used. Fluorescein labeled antisera to IgG, IgM, C3, IgA, and fibrinogen was applied on all these cases and patterns were noted. Histological findings with special stains wherever applicable were noted and correlated with DIF findings. Because HE and DIF are subjective findings two pathologists reported the slides independently. The final diagnosis (Gold standard) was rendered mainly on histologic criteria with attempted clinical correlation. Our study comprised a total of 155 patients with male to female ratio of 1.24:1. These patients varied in age from 7 to 65 years with a mean of 36 years [Figure 1]. LPP was the most frequent category comprising of 36.7% of the cases. Because this was a retrospective study and LP was also rendered as one of the histopathological diagnosis in cases of CA, so it is considered as a separate entity and is not considered together with LPP. Other conditions with their frequencies have been depicted in [Table 1]. Histomorphological and DIF findings were detailed and are summarized in [Table 2]. Those cases which did not have any specific features and a definitive diagnosis could not be given either on microscopy or DIF or both were included in the Nonspecific (NSP) category. Descriptive statistics were applied along with ANOVA test and following inferences were drawn. The overall frequency of occurrence of various immunoreactants are tabulated in [Table 3]. IgG positivity helps significantly in differentiating LPP from DLE (P value 0.004) and NSP from DLE (P value 0.005). IgM positivity helps significantly in differentiating LPP from LP (P value 0.04), LP from PPB (P value 0.00) and NSP (P value 0.00). C3 positivity helps significantly in differentiating PPB from DLE (P value 0.02). DIF did not contribute in the diagnosis of the NSP cases. In these cases, none of the immunoreactant was positive at any location, so DIF was not of much help over and above histopathology in these cases. Because clinical differentiation between the various causes of CA may be difficult, scalp biopsy is mandatory for diagnosis. It enables an accurate diagnosis in the majority of cases especially if correct biopsy technique is used. Our purpose in conducting this study was to study the histological and immunological findings in patients with CA, and to determine the role of DIF in diagnosing CA in Indian context. Very few Indian studies have been performed including one with 20 cases with no statistical correlation between DIF and histopathological findings. On extensive search of world literature, it was found that this is by far the largest study in this context. Of 155 scalp biopsy specimens reviewed, a definite diagnosis was made in 129 cases (83.2%) by histopathological examination alone and independent of DIF. In order of frequency, most common cause of CA in our setting was LPP comprising of 36.7% of all the cases. In 26 cases, no specific diagnosis could be reached, so were collectively kept in the category of NSP findings (NSP; 16.7%). Our findings are similar to study of 33 cases by Amato et al. who reported 33.3% cases of LPP as most common cause of CA. In a study of 136 cases by Trachsler et al., LP (26%) constituted majority of cases followed by DLE (21%) and FD (20%). Of the LP cases, 81% were positive for IgM and 45% were positive for C3. IgG and C3 were positive in 2 cases each with fibrinogen positive in a single case. IgM positivity helped in differentiating LP from LPP, PPB, and NSP. Positivity of DIF depends on various factors as site of biopsy, topical therapy, maintenance of ambient temperature, and stage of disease (acute, subacute, or chronic). Thus, alterations in any of the factors can lead to negative results. By histopathological examination, correct diagnosis could be reached in 90.32% (140) cases. Histopathology alone correctly diagnosed 86.6% cases of LPP, 84.6% cases of DLE, and 90% cases of LP. This is consistent with findings of Trachsler and Trueb and Moure et al., All the cases of PPB, FD, and FF were correctly diagnosed. DIF corroborated with histopathological findings in 85.7% cases and supplemented in making correct diagnosis. There was high degree of agreement between histological diagnosis and final diagnosis depending on histopathology and DIF. This is consistent with findings of Trachsler and Trueb who reported the accuracy to be 97% on histopathology alone. Similar findings were reported by Moure et al. who observed accuracy of 97.4% if combination of HE, PAS, and elastic tissue stain is used. The PCA is a diagnostic challenge both for the clinician and pathologist. CA is a trichological emergency, thus, requiring aggressive management to prevent further follicular destruction.,, DIF has supplemental role in CA especially in lymphocytic group. IgG helps in differentiating DLE from LPP and NSP. IgM helps significantly in differentiating LP from LPP, PPB, and NSP. C3 positivity helps significantly in differentiating PPB from DLE. We conclude that by screening multiple sections, histopathological examination enables a precise diagnosis in majority of CA. Although DIF did not contribute in the diagnosis of NSP cases, it has role in other cases and is a good adjunct to traditional microscopy. DIF findings do not add to the histopathological findings to reach to a definite diagnosis. Amato L, Massi D, Berti S, Moretti S, Fabbri P. A multiparametric approach is essential to define different clinicopathological entities within pseudopelade of Brocq: Reply from authors. Br J Dermatol 2002;148:1270-90. Sperling L, Solomon A, Whiting D. A new look at scarring alopecia. Arch Dermatol 2000;136:235-42. 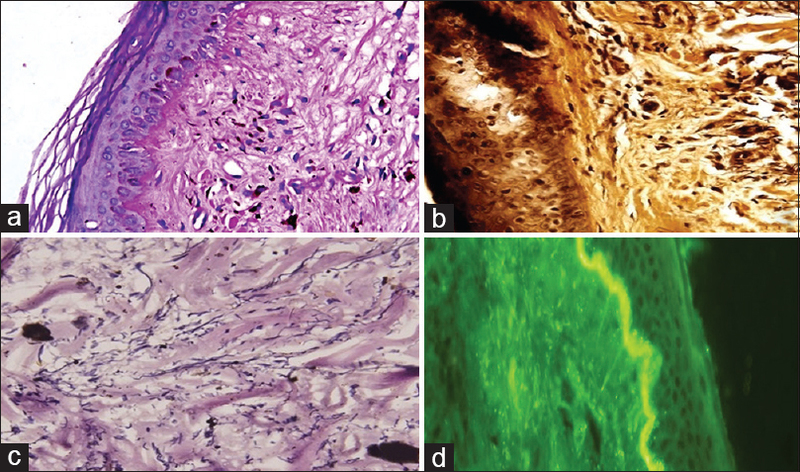 Sorna Kumar L, Shanmugasekar C, Vignesh S. Correlation between clinical, histopathological and direct immunofluorescence findings in cases of cicatricialalopecias. Int J Res Dermatol 2016;2:99-102. Dogra S, Sarangal R. What's new in cicatricial alopecia? Indian J Dermatol Venereol Leprol 2013;79:576-90. 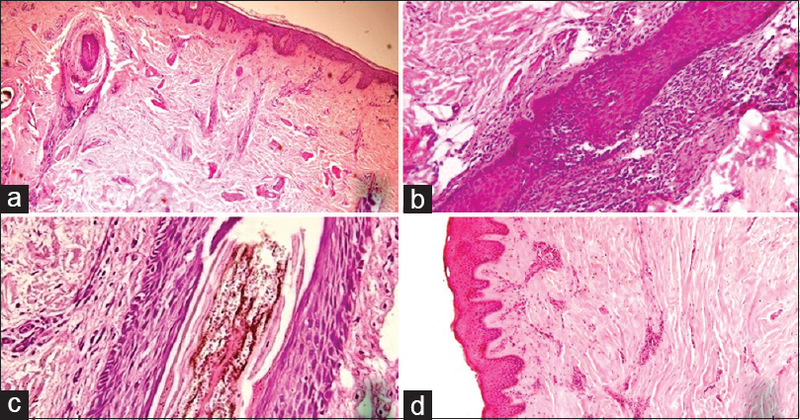 Annessi G, Lombardo G, Gobello T, Puddu P.A clinicopathologic study of scarring alopecia due to lichen planus: Comparison with scarring alopecia in discoid lupus erythematosus and pseudopelade. Am J Dermatopathol 1999;21:324-31. Trachsler S, Trueb RM. 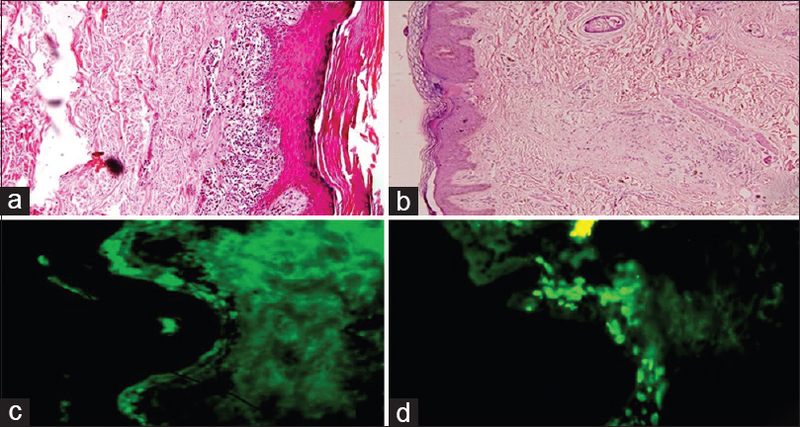 Value of direct immunofluorescence for differential diagnosis of cicatricial alopecia. Dermatology 2005;211:98-102. Chieregato C, Zini A, Barba A, Magnanini M, Rosina P. Lichen planopilaris: Report of 30 cases and review of the literature. Int J Dermatol 2003;42:342-5. Sperling LC. Scarring alopecia and the dermatopathologist. J Cutan Pathol 2001;28:333-42. Otberg N. Primary cicatricialalopecias. DermatolClin 2013;31:155-66. Donati A, Gupta AK, Jacob C, Cavelier-Balloy B, Reygagne P. The use of direct immunofluorescence in frontal fibrosingalopecia. Skin Appendage Disord 2017;3:125-8. Bolduc C, Sperling LC, Shapiro J. Primary cicatricial alopecia: Other lymphocytic primary cicatricialalopecias and neutrophilic and mixed primary cicatricialalopecias. J Am Acad Dermatol 2016;75:1101-17. Moure ER, Romiti R, Machado MC, Valente NY. Primary cicatricialalopecias: A review of histopathologic findings in 38 patients from a clinical university hospital in Sao Paulo, Brazil. Clinics 2008;63:747-52. SinclairRD. Acquired cicatricial alopecia. In: Burns T, Breathnach SM, Cox N, Griffiths CE, editors. Rook's Textbook of Dermatology. 8th ed. Oxford: Wiley-Blackwill Publishing; 2010. p. 66.38-52. Brooke RC, Griffiths CE. Folliculitis decalvans. ClinExpDermatol 2001;26:120-2. Amato L, Mei S, Massi D, Gallerani I, Fabbri P. Cicatricial alopecia: Adermatopathologic and immunopathologic study of 33 patients (pseudopelade of Brocq is not a specific clinicopathologic entity). Int J Dermatol 2002;41:8-15. Tan E, Martinka M, Ball N, Shapiro J. Primary cicatricialalopecias: Clinicopathology of 112 cases. J Am AcadDermatol 2004;50:25-32. Fung MA, Sharon VR, Ratnarathorn M, Konia TH, Barr KL, Mirmirani P. Elastin staining patterns in primary cicatricial alopecia. J Am Acad Dermatol 2013;69:776-82.